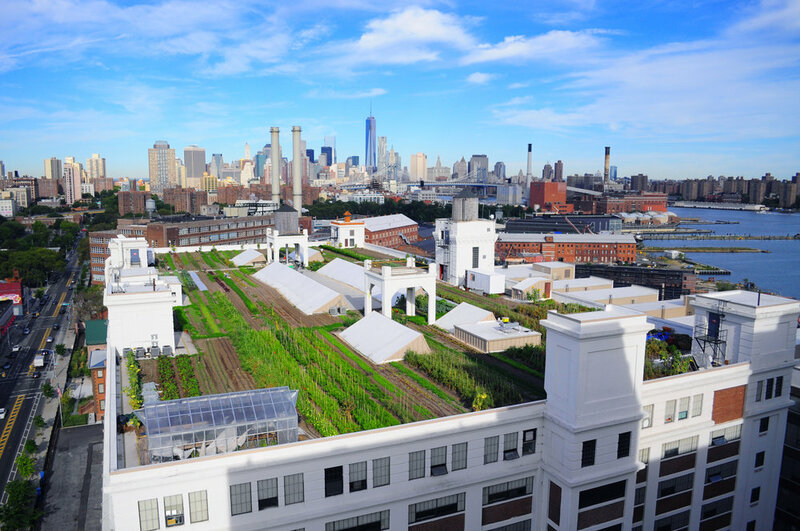 Brooklyn Grange is the leading rooftop farming and intensive green roofing business in the US. We operate the world’s largest rooftop soil farms, located on two roofs in New York City, and grow over 50,000 lbs of organically-cultivated produce per year. We also operate an apiary, keeping bees in over 30 naturally-managed honey bee hives, on roofs dispersed throughout NYC. In addition to growing and distributing fresh local vegetables and herbs, Brooklyn Grange also hosts events and educational programming, provides urban farming and green roof consulting and installation services to clients worldwide, and partners with numerous non-profit organizations throughout New York to promote healthy and strong local communities. One early morning in May of 2010, a ragtag crew appeared on Northern Boulevard, alighting from bicycles and emerging from the subway steps at 36th St, assembling in the dim light outside a sprawling building. They donned hard hats and thick, plastic-coated work gloves and, armed with shovels and rakes, they set out to build the largest soil rooftop farm in the world. The job took six days of craning hundreds of 3,000lb soil sacks seven stories up to the roof. The hardworking crew shoveled in the sun and wind amidst the roar of motorized buggies and the shouted communications of a team single-minded in its goal. As the West end of the urban farm was still being measured and fit with the base layer of a green roof system, the East end was already being shaped into tidy, perfectly-spaced vegetable beds studded with tomato seedlings and chard transplants. And slowly, a farm took shape. When we set out to grow food on the rooftops and unused spaces of New York City, our mission was to create a fiscally sustainable model for urban agriculture and to produce healthy, delicious vegetables for our local community while doing the ecosystem a few favors as well. Currently, with over two acres of rooftops under cultivation in Brooklyn and Queens, we’ve sold over 500,000 lbs of vegetables to restaurants, CSA members and directly to the public via weekly farmstands. But we’ve expanded beyond our mission to grow vegetables: we now keep egg-laying hens and have launched a commercial apiary. Our educational non-profit partner, City Growers, has hosted 17,000 NYC youths each season for educational tours and workshops. We’ve educated countless adults via our workshops on topics ranging from natural fabric dyes to making hot sauce. Our rooftops are constantly abuzz with activity: during the day, we may be harvesting for a restaurant order, or hosting a visiting office group for a corporate retreat; at night we transform into a romantic event space for yoga classes, dinner parties, and wedding ceremonies. But at our core, we are a farm, and growing nutritious, tasty food is our passion. Doing so in New York is our dream. We believe that this city can be more sustainable; that our air can be cooler and waterways can be cleaner. We believe that the 14% of our landfills comprised of food scraps should be converted into organic energy for our plants and plants around the city via active compost programs. We believe that food should be fresh, not sitting on the back of a flatbed for two weeks. We believe that food should taste fresh. At the end of the day, that’s what it’s all about: sitting down with our farmily, admiring that sunset over the city skyline, snacking on a perfectly ripe, sweet tomato and remembering, this is what real food is.